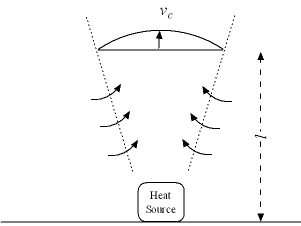 A heat source, like an engine, stove, melting pot or a person, will generate a convective vertical air flow as indicated in the figure below. Engineering ToolBox, (2005). Convective Air Flow from a Single Heat Source. [online] Available at: https://www.engineeringtoolbox.com/convective-heat-source-d_1007.html [Accessed Day Mo. Year].